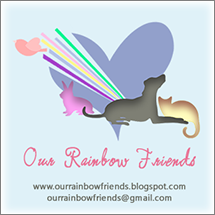 Click on Sam's name above to visit for more! Boy, oh boy, did I ever get excited when it came time for the letter "T". I mean that's my letter. Fur sure, fur real, 100%. I love the letter "T". It's for ME! And so, without further ado, a poem by me, to be read by you! We love the poem about your Toof Zoey. Zoey, that toof of yours is very famous. We wouldn't know you without it. That sure is a great poem. We like that a lot. I happen to think this is a PURRRFECT "T" poem by you Zoey but I ALSO think you look PURRRRFECT with your extra-special toofie! 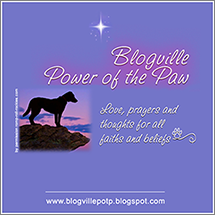 It makes you even more special than you already were and just look how FAMOUS you are because of it.....Thanks so much for pawticipating in my Thoroughly Poetic Thursday fun. We're going to start over at "A" after we finish going through the alphabet this first time - - - having too much fun to stop! 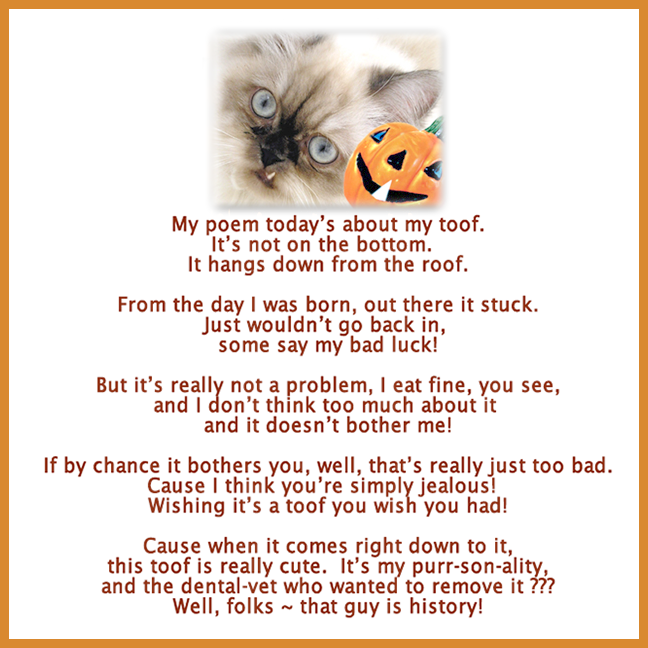 We just so happen to love your toof, Zoey, and this poem! My girl Eddy has a toof quite similar to this lovely one of yours (although caused by facial nerve paralysis that keeps her lip pulled back, but close enough, right?). Purrs to you and your toof, Zoey! WE think your toof is adorable!! What a nice poem about your toof! No one wants to be like everyone else...except high-school girls! Toof-i-fy the world, Zoey! You look marvelous! Such a beautiful poem about your Toof Zoey!!! You look so cute! That is a lovely poem about your Toof, Zoey. It is your trademark. Zoey wouldn't be Zoey without her special toof!!! Terrific T poem. And what a great poem! Very cute poem. I love your toof. Love your toof, too! It helps you stand out in a crowd!! That's the cutest poem we ever heard about a cute tooth!